Listed below are some of our more noteworthy news articles concerning MABGA and our Junior Golf program. These articles include accomplishments from our active and previously active members. In 2015, MABGA President Mario Tobia participated in five National and International golf tournaments. In June, accompanied by his coach and son Matt, they went to Mt. Kisco, NY to compete in the Guiding Eye Classic. Normally, that event is for the top 10 players in the US, but this year, the tournament committee invited Israel’s Zohar Sharon, the number one ranked player in the world. Mario finished in second place with a Stableford score of 49, the highest tournament score in the last 10 years and Mr. Tobia’s personal best. Unfortunately, Mr. Sharon scored 56 and won the event. In July of 2015, accompanied by his two sons, Matt and Michael, Mr. Tobia traveled to Milan, Italy to compete in the World Match Play Championship. This event matches the top four players in each sight category from North America with the top four players from the rest of the world. Mario won two of three matches, leading the North American team to the highest point getter on his squad. The Rest of the World team narrowly defeated the North Americans players in a very spirited and highly contested tournament. Later in July, accompanied by his teaching Pro and coach, Frank Hesson, Mr. Tobia traveled to Nova Scotia, Canada for the Nations Cup. This event matches the top 10 players from the United States with the top 10 players from Canada. The US team struggles and so did Mario and were soundly defeated by the Canadians. In August, again accompanied by his coach, Frank Hesson, Mario traveled to Marietta, Georgia to compete in the United States Blind Golf National championship held at the City Club Golf Course. Mr. Tobia took first place becoming a two-time USBGA national champion and retaining his number one ranking in the United States. Two months later, coached by Frank Hesson, Mario took second place in the American Blind Golf National Championship, narrowly losing to Phil Blackwell, a former world champion. That event was held on the Republic Golf Course in San Antonio, Texas. With those distinctions, Mario retains his number one ranking in the United States and is currently ranked fourth in the world. In 2014, George Pilz. Another accomplished MABGA member. Took the low net honors in the USBGA Championship again held at Exeter Country Club in Exeter, Rhode Island, beating everyone in the field after adjusting his score by his handicap. Other note worthy accomplishments include members who several years ago shot an eagle and three MABGA golfers who shot a hole in one. That’s right, three blind golfers who ace their shot on a par 3 hole. The first was recorded by Rod Ryan at the Meadowland Country Club on their 120 yard 14 hole on August 1, 2003. Larry Ruttenberg recorded the second hole in one at the 120-yard par-3 12th hole at the ACE Club in Lafayette Hill, and most recently, Sheila Drummond , a former MABGA member, shot her ace on the 144-yard, par-3 fourth hole at Mahoning Valley Country Club on Sunday, August 19, 2007. Other articles are about the charity events attended by some of our blind golfers and coaches. Each event shares the common theme of helping the blind community and people in need. It is our pleasure to use our golfing talents to help make these worthwhile causes a success. (CNN) — You approach the tee, select your club, adjust your hands, align your feet and visualize your swing. It’s a routine practiced by millions of golfers around the world. Now imagine doing it with your eyes closed. All the time. That’s what it’s like for Mario Tobia, a four-time American blind golf champion redefining what’s possible on the course. “When I first lost my vision it was pretty traumatic,” Tobia tells CNN Sport. “I had to stop working and things like that. Tobia regularly drives the ball over 240 yards — just 50 yards less than the PGA Tour average. Typically scoring in the high 90s and low 100s in a casual round, the New Jersey native has shot as low as 86. But, of course, he doesn’t do it all alone. Enter Frank Hesson, a golf coach with a difference. “I’m Mario’s guide,” says Hesson. “Usually we’ll get out to a golf course, go through a warm up program, just like anyone else would. “Mario knows through his own practice how far he hits the ball with each of his golf clubs. Basically, he relies on me to give him some lie conditions. “When he’s ready, I grab the club and set it physically behind the golf ball. I tell him to open or close the club face, depending on whether it’s lined up correctly. It’s moments like that which provide Tobia temporary escapism from his blindness — brought on over the course of 25 years with a degenerative condition called Retinitis Pigmentosa. “Blind golf gave me a goal and something I wanted to accomplish,” he says. “With the help of my kids I started improving my game and, as time went on, I started seeking professional assistance with coaches like Frank. While Tobia might not be able to gaze up at the trajectory of his ball, or watch as it rolls into the cup, the satisfaction of a sweetly-struck shot is a feeling shared by both player and coach. “Putting has always been a strength of mine, and I’ve retained that, even through losing my sight,” says Tobia. “Of course, I rely heavily on Frank now for the direction, and he takes care of the breaks and speed. But if we call it a 10-step putt, I know exactly how hard I have to swing for the ball to go 10 steps. Technology has also come to Tobia’s assistance in the form of the K-Vest, a wearable device that provides provide real-time audio and visual feedback on the golfer’s posture and swing. Training through feel, Tobia can work on his game from the comfort of his own home. “The learning curve is so much quicker,” he explains. “One of the biggest problems I have is Frank and I will work on something but then I won’t see him for a week or so. “I have a net in my backyard and a platform in front of it, all lined up. But when I practice there, I have no feedback from Frank, so before it wasn’t uncommon for me to be out of sync with the motion all wrong by the time we next meet up. The duo can cause quite the stir among the unacquainted out on the fairways and greens. Tobia recounts a particular round where he played with the aid of his son, Matt. All of a sudden, after hitting something of a rough patch, Tobia became aware of some commotion between his son and the group behind them on the course. “All of a sudden he realizes what has been going on. He was seeing my son lining me up for every shot, walking the steps with me and presuming I was having lessons out on the course. Such stories are testament to the levels Tobia and Hesson have been able to achieve, proving “you don’t have to see it to tee it,” as the The United States Blind Golf Association motto proclaims. Having finished fourth in the world two years ago in Japan, they’re now eying up top spot at the upcoming Blind Golf World Championships in Rome. What a great journey it has already been for the 62-year-old, who could have quite easily walked away from sport forever when he first received his diagnosis. Looking back now, what would Tobia say to others around the world that are facing similar afflictions? “For me, it would be to keep on living,” he says. “Find something that interests you; find something that you enjoy doing and got out and do it. “For me, that’s the best advice I can give to somebody. Don’t succumb to blindness, stay home and pity yourself. “Put yourself out there and just see what happens. Good things will happen. I’ve met a lot of great people, including Frank who I probably wouldn’t have met. Mount Laurel’s Mario Tobia (left) and his coach Frank Hesson, of Medford Lakes, return to their golf cart at the Medford Lakes Country Club on Thursday, April 27, 2017, during a golf outing of the Middle Atlantic Blind Golf Association. On Thursday, April 27, the Middle Atlantic Blind Golf Association (MABGA) is holding a golf opportunity for visually impaired individuals. The event will be a 9-hole golf tournament followed by a luncheon for participants. The upcoming event will be hosted by Medford Lakes Country Club, located in Medford Lakes. MABGA was formed in 1948, and for over 68 years has been assisting both junior and adult individuals with the sport of golf. Each blind golfer is paired with a volunteer coach who performs as a mentor throughout the golf season. Participants are welcome and can be paired with blind golfer and coach. Spectators are encouraged to come out to the country club and cheer the golfers on. For more information is available at both www.mabga.org. Interested people can also send an email to the Medford Lakes Country Club at gm@medfordlakescountryclub.com. Barrington resident Jon Paul Corman, 9, who is legally blind, acclimates to his new pair of eSight eGlasses Thursday, March 30, 2017 in Philadelphia. In front of the third-grader’s eyes was a set of eSight Eyewear: a camera, a powerful computer and LED screens that help legally blind people see images in real time. As a company representative showed him how to use the technology, Jon Paul gazed around the hotel meeting room, swiveling his head to see his mother’s face, a laptop, a camera. After the Courier-Post chronicled his family’s $15,000 fundraising campaign in December, donations poured in from local Lions Clubs and other civic organizations, individuals and anonymous donors to help the 9-year-old get his own pair. Within 10 weeks, the campaign raised more than $12,000 toward the cost of the glasses – and then the company dropped the price for the latest, lighter version to $10,000. The extra money was given to help buy eyewear for another user. Jon Paul could only see light when he was adopted at age 3 from China. After corrective surgery and glasses, the third-grader could see colors and shapes, and read very large print. He uses a cane to help him get around and is learning how to read Braille. After an eSight demonstration last summer, the boy bugged his parents repeatedly to get him his own set. “Are we bringing the eSight home?” Jon Paul asked from beneath the eyewear, half whispering to his mother. The eSight Eyewear processes images from a live video stream and delivers them in real time onto LED screens in front of the user’s field of vision. The headset captures whatever the user is looking at, whether it’s a printed book or a person across the room or at something far away. The Toronto-based company began selling the headwear in 2013; it has sold a couple hundred since then. Brandon Leibgott, an eSight representative, was impressed with how easily the child adapted to the eyewear. Corman said she couldn’t wait to take Jon Paul to the zoo, so he could finally see the animals. 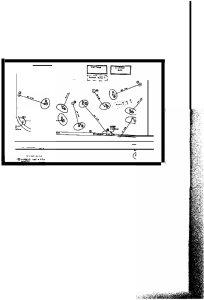 Preliminary sketches provided by Norman Kritz for a nine-hole golf course and practice putting green at the Maryland School for the Blind. No hole on the proposed course exceeds 60 yards. KRITZ is a Philadelphia-area pharmacist. Charitable involvement turned him into a golf course architect. His first – and still only -completed project resulted in a playable course for blind children. The nine-hole course at Overbrook School for The Blind opened in 1996. Programs conducted at the course receive help from numerous industry efforts, including the GCBAA Foundation Sticks for Kids. track, making the course wheelchair accessible. The facility took two years to build. Along the way, the MABGA has received help from numerous Philadelphia-area golfers and pros who volunteer time to offer instruction and services such as resizing and regriping donated clubs. The junior program received a boost when it established a relationship with the GCBAA Foundation Sticks for Kids program. Kritz, who directs the MABGA’s junior programs, drove from Philadelphia to Jersey City, N.J., in early August to attend the annual GCBAA Foundation auction and raffle. Kritz mingled with GCBAA members and gave a passionate presentation about how support from efforts like Sticks for Kids help blind children. Sticks for Kids provides the MABGA with clubs, bags and other equipment. An encounter at the GCBAA meeting could help Kritz accomplish his goal of designing another course for blind children. Chris Hill, the President of Georgia-based Course Grafters, has committed to offering his company’s expertise when work starts at a site in Macon, Ga. No timetable has been established for the project, but Kritz is eager to work with a professional golf course builder. Kritz also has completed preliminary sketches for a nine-hole course and putting green at the Maryland School for the Blind. Multiple holes on the Maryland course will be wheelchair accessible. Kritz says. “They are puttable. Let’s put it like that. Peg and Tom Harrington hold a photo from their wedding day on May 1, 1948, as they approach their 66th wedding anniversary. Photo by Jennifer Connor. When asked what the secret to a long and successful marriage is, 87-year-old Tom Harrington, shakes his head. After being married to his wife Peg for nearly 66 years, Tom says there is no secret. Coordinating their efforts was necessary in order to raise their 10 children — nine of whom were boys. Peg said some of her go-to meals included hot dogs and baked beans and spaghetti and meatballs, though she emphasized that she does love baking her specialties of chocolate chip cookies and brownies. Peg and Tom met in high school at a Christmas party — Tom a senior and Peg a junior. Though they grew up in the same zip code, they never met before, in part because Tom went to the all-boys Catholic school St. Joseph’s Prep and Peg attended the all-girls school Mount St. Joseph’s. “I thought he had a great sense of humor and he loved to dance,” Peg said. They began going to the weekly dances at Holy Child in Philadelphia and have been dancing ever since. When Tom graduated high school in 1943 he attended St. Mary’s College of Maryland where he enrolled in the naval officer program, which transferred him to Penn State for a semester and then to Villanova to finish his program. While at Penn State, the Navy took over all of the fraternity houses near Rec Hall. Tom lived in the Phi Delta Theta house. Upon graduating officers school, Tom served in the Navy from 1945-48. He never saw direct combat, but his service took him from Pearl Harbor, across the Pacific Ocean as far as Japan. When he came home on breaks, he and Peg would go out — usually dancing. After his service, he moved in with his parents, and he was in her parents’ living room when he asked Peg to marry him. They married on May 1, 1948, in a formal wedding service at Little Flower Parish in Mount Airy. The second of four girls, Peg was the third to wear the same wedding dress as her sisters. Her mother handmade the bridesmaids’ dresses and hats. Tom and Peg spent a week at Split Rock Lodge in the Poconos for their honeymoon then moved in together in Abington. When their only daughter and oldest child Marti was born, Peg left work to raise her children, who are — in order from oldest to youngest — Marti, Tommy, Jay, Richard, Tim, Greg, Beau (Robert), Andrew, David and their youngest (and Lansdale resident) Stephen. The hardest part of their marriage was the loss of three of their children. They lost Jay at age 7 to nephritis, a disease that causes inflammation of the kidneys. Their son Tommy also tragically died during his senior year of high school as a passenger in an automobile accident. Richard, at the age of 52, lost his life to a brain aneurism. Today, to keep busy, Tom plays golf — even though he is legally blind. About 20 years ago, macular degeneration along with glaucoma caused severe vision loss in both of Tom’s eyes. He joined the Middle Atlantic Blind Golf Association where he just became the acting president. The group of 32 players — 22 men and 10 women — 15 of whom are completely blind, play about 35 games in their season from April to October. Peg stays busy catching up on the phone with her children, 13 grandchildren and two great-grandchildren, and continuing to bake. “I think truly we are really great friends that are very fortunate to still have each other,” Peg said. If you are a part of or know of a couple who has been together for many years and would like to share your story, contact Jennifer Connor at jconnor@thereporteronline.com or on Twitter @Journalist_Jen. The organization has grown a lot since being founded in 1994. In 1994, a new world was created for children and Young adults ages five to twenty-one who were Visually impaired or blind. Due to the vision and determination of Gil Kayson, a blind golfer, his wife, Sandy, and their dear friend, Norman Kritz, a sighted golfer, visually impaired and blind children and young adults can now learn and participate in the Wonderful game of golf. The story begins with the creation of the Middle Atlantic Blind Golf Association (MABGA) in 1948. A blind lawyer and Golfer named Robert Allman had the desire to share the joys of golf with his blind friends. His dream was to organize competitive Golf within the blind community. This dream became a reality when a small group of blind golfers started playing rounds of golf every Sunday at the Juniata Golf Club in Philadelphia, With the help of Joe Hunsberger, golf professional and his assistants. In 1949, Bob Allman’s friend, Francis Strawbridge, Jr, was elected as the organization’s first president. For the next three decades, MABGA continued to thrive, reaching out to hundreds of blind golfers in the Delaware Valley and beyond. Then, in 1980, Gil Kayson, a blind businessperson, sports enthusiast, learned about the association. Several years passed and Kayson continued to enjoy the game of golf while making many new friends, both sighted and blind. One of these friends, Norman Kritz, a sighted golfer had experience building chip and putt golf courses for troubled youth. Driven by their passion for the game of golf combined with their love of children, Kayson and Kritz, along with Kayson’s wife, Sandy, shared a vision to create a junior golf program for blind children to learn and play golf. Jim Ganter, an active MABGA member who later became president, was very much interested in the program and instrumental in helping it get started. Ganter, Kritz and the Kayson’s all agreed that they wanted to have a golf course specially built and designed to meet the challenges of visually impaired and blind golfers. However, there were many obstacles that they had to overcome to accomplish their goal. First, they needed to find a suitable location. In addition, the resources to make their vision a reality. Kritz’s children, an architect, and a landscape architect, agreed to generously donate their time and expertise to help design the golf course. Kayson and Kritz reached out to the Overbrook School for the Blind and soon their vision would become a reality. The Overbrook School agreed to donate land on its campus that would become the future site for a golf course dedicated to the Junior Blind Golf program of the MABGA. Under the direction of Norman Kritz and his children, the custodial staff at the Overbrook School would change the campus forever. Everyone worked diligently and finally, on Sept. 25, 1996 the Robert G. Allman golf course was dedicated to the Junior Blind Golf Program. With the completion of the course, the group now turned their focus to reaching out to the visually impaired and blind community to apprise them of the wonderful development. Flyers went out to blind schools and blind organizations looking to recruit young golfers. At the same time, they began to seek out golf professionals who would volunteer to teach the children how to play golf. Al Balukas, a golf professional and mentor for MABGA agreed to help find the golf professionals for the children. Fifteen children contacted them and the Junior Blind Golf Program was under way. Now, the organization was faced with one final challenge. They needed to obtain equipment to enable the children to play the game. The children would need properly sized golf clubs and shoes. Kritz worked diligently to obtain donations of golf equipment. Donated golf clubs would be cut down and sized specially to fit each child. Every child provided his or her age, height and whether it were right or left-handed to insure the clubs were properly measured. Each child received his or her own customized free set of clubs, shoes and a glove. The parents provided the names and addresses of five golf courses closest to their home so Al Balukas could find a volunteer professional to teach the visually impaired/blind child how to play golf. The golf professionals were eager to participate in this wonderful program. The parents then had to contact the assigned golf professional to schedule a convenient time for their children’s lessons. The association encouraged the parents that golf, different from other sports, was a game that their child could play for a lifetime. With the parents’ guidance and support, their children would be given the opportunity to enjoy a sport for life while making many new friends along the way. And furthermore, the Junior Golf Program, with continued support of the MABGA, would provide their children this incredible opportunity at no cost. With the golf lessons having begun, the Junior Blind Golf Program held its first golf clinic and outing in the spring of 1997, bringing together visually impaired/blind children and their families to enjoy a wonderful day of golf. There, the children and their families would make new friends and celebrate their accomplishments. 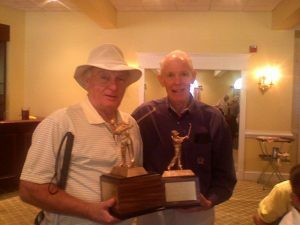 They shared smiles and stories and learn that with some persistence and dedication, they too can enjoy the excitement of playing the game of golf. Since the program’s inception, golf clinics and outings are held twice each year, in the spring and the fall. A volunteer golf coach is assigned to assist and guide each child on the course. With the help of a group of dedicated volunteers led by Sandy Kayson, the outings have been a tremendous success. Each event concludes with a wonderful luncheon for the entire family, and trophies and prizes to recognize the participants’ achievements. Since its inception, participation in the program has continued to grow, reaching hundreds of children and their families over the years from many states including Pennsylvania, New Jersey, Delaware, New York and Maryland who attend the outings in addition, take private lessons from golf professionals. Recently, children from as far as North Carolina and Colorado have joined the program as well. What makes the Junior Golf Program especially successful has been its ability to attract visually impaired/blind children with diverse interests and backgrounds, which are brought together for one common goal, to be able to learn and play the game of golf while making new friends for life. With this unified focus, these children are taught the important values of commitment, dedication and perseverance, which will serve them well not only in the game of golf, but also in every endeavor that they will pursue throughout their lives. One does not have to look far to see some of the incredible successes of the Junior Blind Golf Program. Brian Mackey, a participant in the program for several years just completed his First year in the adult program of the MABGA and currently serves as a mentor and an assistant golf coach in the Junior Program. Another young man Patrick Molloy, who started as a Junior Blind Golfer when he was seven years old is now in his junior year at Muhlenberg College. Molloy plans on attending law school upon graduation to pursue a career in law. Another graduate of the program, Casey Burkhardt, received his master’s degree from Villanova University and is currently working for Google. Jon Gabry, a deaf-blind junior golfer and an artist, is the poster child for the Helen Keller National Center? Gabry has been selling his art work in both New Jersey and New York and currently has four pieces on display in the Metropolitan Museum in New York City. The parents of these children have expressed that their children’s participation in the golf program has helped give them the confidence to pursue their dreams. The program has also served as the inspiration for the authoring of the book, “A Million Dollar Putt,” written by Dan Gutman. Gutman specifically acknowledges the work of the year’s outings. Another success of the program occurred two years ago when Kritz and Kayson were approached by the First Tee organization in Philadelphia. This organization has a program that teaches children (not blind) how to play golf. First Tee thought it would be wonderful if the Junior Blind Golfers could play golf with the First Tee members. The idea was approved. In addition, this past year six outings were held at the Walnut Lane golf course in Philadelphia. These outings proved to be a huge success for all. This “learning by teaching” experience provides the children an invaluable experience that they can draw upon throughout their lives. The collaboration demonstrated to sighted children, not just what blind children could accomplish, but also what other physically challenged children are capable of achieving. Perhaps the program’s most exciting news in 2013 came when they were contacted by Steve McWilliams, a film producer and writer, who works in the disabilities office of Villanova University. McWilliams is in the final stages of the creation of a documentary featuring the story of the development and success of MABGA’s Junior Blind Golf Program. To create the documentary, Steve McWilliams and his staff attended an outing, where he interviewed Kayson, Kritz and the junior blind golfers and filmed the children playing golf. The hope is that this documentary will heighten the awareness of the Junior Golf Program, while serving as an inspiration to others to help expand the opportunity for visually impaired/blind children to other cities across the country. It has been an incredible journey thus far for The Junior Blind Golf Program. The founders, officers and volunteers of this program encourage parents, relatives, friends and teachers of visually impaired or blind children to make this a priority and spread the word. The dream is that many more children can take advantage of all that this program has to offer. For more information on the organization visit www.mabga.org/junior-golf.htm or call Gil Kayson at 215-884-6589. 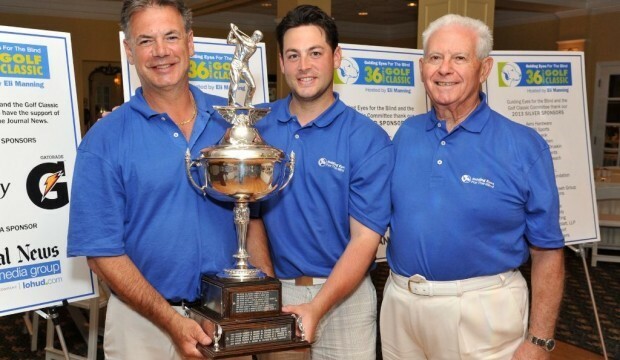 Photo courtesy of Guiding Eyes for the Blind – Mario Tobia (left) won the 2013 Corcoran Cup, coached by son Matthew Tobia, with Guiding Eyes for the Blind’s Golf Classic Chairman Al Maiolo. Guiding Eyes for the Blind Corcoran Cup At Mount Kisco C.C. Founded by PGA legend Ken Venturi in 1977, the Guiding Eyes Golf Classic has raised over $8 million since its inception. As part of the Classic, Guiding Eyes presents the Corcoran Cup, the “Masters” of blind golf. This year thirteen of the country’s top blind golfers vied for the coveted trophy, each with the help of a coach who aids in club selection, alignment, setup and distances. MARIO TOBIA was 25 when a doctor diagnosed him with retinitis pigmentosa, a degenerative eye disease that would leave him blind. The doctor told him that by age 30 he would have night blindness; by 40 he would no longer be able to drive; and by 50 he would have to walk with a cane. The doctor told him to begin preparations for a future without the ability to see. It was devastating news. Tobia could not bring himself believe it. Surely, he told himself, there was some error in his diagnosis, that perhaps the problems he had been having picking up the ball off the bat in his softball games were due to something else. So Tobia did not prepare himself as the doctor recommended, only to discover that his prognosis had been correct. With each passing year, his vision continued to dwindle until it vanished completely and left him steeped in darkness. Tobia began playing golf at age 30, in part because his deteriorating vision prohibited him from participating in any sports that involved hand-eye coordination. At Cinnaminson High School, he had competed in football and track and field. He won a partial scholarship to La Salle to throw the discus. Golf enabled him to continue to compete until he could no longer see the targets on the course. It was not until he discovered the Middle Atlantic Blind Golf Association in 2000 that he began playing again. Nationally, he has competed in events with the U.S. Blind Golf Association and the American Blind Golf Association. He has won four ABGA and USBGA events the past 2 years, including the 2010 ABGA championship in the Blind Division. Although he shoots in “the mid-90s to 100,” he says his goal is to shoot in the 70s at some point. With the help of his two sons and a coach, Steve Rodos. Does Tobia consider what he has done courageous? Good enough to fool some fellow golfers out on the course, according to his son. Local blind golfer refuses to stop teeing off: Mario Tobia needs a lot of help, but he’s one of the top blind golfers in the nation. EVESHAM — A green golf cart with a white roof zips down a path toward the 18th tee at Indian Spring Country Club, slowing down only to negotiate water puddles left from afternoon showers. When arriving, a well-tanned 57-year-old who was born in Italy and moved to South Jersey at age 1 hops out from the passenger seat and walks to the back of the cart. Mario Tobia fiddles with his golf bag for a few seconds, pulls a white Titleist ball from a side pocket, grabs his Ping G20 driver from a compartment and waits for his coach to provide first a helping hand and then instruction. Steve Rodos, a 75-year-old retired Philadelphia attorney who seems to get around like he’s 60, grabs Mario by the arm, then together they walk to the second tee from the back, the white one that’s for men. Staring down at his iPhone, which has a golf GPS app called up, Steve announces that the flag is 482 yards from the tee. Mario nods, takes a big practice swing, then inches forward toward his teed-up ball. Steve, dressed in shorts, a golf shirt and a baseball cap, moves in to carefully study Mario’s positioning and barks out a quick adjustment that results in a tiny leg shift. He backpedals until safely out of harm’s way, then leans forward and sets his hands on his knees. Mario lets loose a sweet-looking swing, and when club and ball meet right where he had intended, that familiar pinging sound momentarily drowns out chirping birds. The ball disappears into the overcast sky before dropping 230 yards from the tee in the middle of the fairway. “OK, that was good,” Steve blurts out. Mario needs to be told where his ball lands because his world is total darkness. He sees nothing out of his left eye and can only tell night from day with his right, and if the sun is shining brightly, he must wear sunglasses to avoid pain. His slow deterioration toward total blindness forced the Mount Laurel resident to stop driving years ago and, beginning in 1995, left him unemployed for a time. But by sheer determination, this amazing man overcomes not being able to see in unimaginable ways. For starters, here’s a fellow who will cook scrambled eggs on his stove for breakfast and hamburgers on his grill for lunch when Ann, his wife of 29 years, is working in Cherry Hill. Mario now earns a living again, too, as a contracted computer technician who formats and repairs PCs for visually impaired and blind Veterans. His golf game is something special among peers. Locally, he dominates playing with sighted partners in 40 annual Middle Atlantic Blind Golf Association tournaments. He’s even better playing on his own in United States Blind Golf Association (USBGA) and American Blind Golf (ABG) national events, finishing in the top three in six of seven tournaments over the last two years, winning three of them. He’s the two-time reigning champion in the American Blind Golf National Championship, held annually in San Antonio, and he’ll be back there again in October going for three in a row. “He’s one of the top three in the country,” Steve boasted. A coach to blind golfers isn’t a typical coach. What this volunteer job really amounts to is being the eyes of the golfer. Steve “coaches” Mario at local events, while Mario’s two children – sons Matt, 28, and Michael, 23, – handle the national tourneys, which include trips to such places as Georgia, New York, Ohio and Texas. Mario knows it won’t be easy, but his quest is to become a much better golfer. His handicap currently is 23.8, which means he’s a little shy of being a bogey golfer. He’s gotten this good despite mostly playing just once a week during the local season, but he’s far from satisfied. Matt, who has a Masters from Fordham and lives in Hoboken, is a 7 handicap. Michael, a recent graduate from Seton Hall who still lives with his parents, is a 10. Matt recently talked Mario into switching from a conventional putter to a belly putter, after having some struggles in a recent national event in New York in which missing “4 or 5 makeable putts” resulted in a second-place finish instead of a victory. The hardest part about being a blind golfer, Mario says, is chipping. Other parts of his game aren’t that difficult. Mario is able to identify his 12 clubs by positioning different kinds of tape in different shaft positions. For instance, he uses hockey tape for his 5 and 6 irons, electrical tape for his 7, 8 and 9. Keeping certain clubs in certain compartments of his golf bag makes it easy for him to differentiate, as well. Mario knows when he strikes the ball well, but needs to be told whether he hit it straight or not. Making good shots never gets old. A year ago, Mario came within an inch of sinking a first hole-in-one on the 106-yard, 17th hole at Philmont Country Club in Huntington Valley, Pa., during an alternate-shot tournament in which he was paired with Patrick Shine, head pro for Commonwealth National Golf Club in Horsham, Pa.
Like everyone, Patrick Shine is inspired by Mario, his partner the last five or six years in an area vision-impaired Pro Am. Steve takes Mario by the arm after his tee shot on No. 18 at Indian Spring, then take their cart to the fairway, stopping a short walk to the left of the only ball nearby. “We’re about 255 away,” Steve says, his iPhone again in hand. “I can’t get there, so I’ll lay up to maybe 100 yards,” Mario responds while clutching his 7-iron. They approach the ball. Steve backs up and goes into his hands-on-knees position. Practice swing. Whack. Mario, who is 6-foot-1, 210 pounds with a full head of dark hair, was 25 when he first noticed he was having eye issues. He’d been nearsighted, but contact lenses had corrected his vision to 20/15. He figured he just needed an another adjustment, and sure enough, an eye doctor examined him and prescribed stronger contacts. He’d always been a good athlete and played baseball, football, tennis, volleyball and ran track at Cinnaminson High School (Class of 1973), and after getting a degree in computers from LaSalle University, he was playing shortstop in an adult baseball league when noticing he was having all kinds of trouble picking up groundballs hit his way. He started going to more doctors searching for answers. About the 10th one finally provided a diagnosis that was terrifying. His condition, a Pennsauken ophthalmologist determined, was Retinitis Pigmentosa, a degenerative eye disorder that affects 1/4000 Americans. “You’re going to have trouble seeing when you’re 30, you’re going to have to stop driving when you’re 40 and you’re going to need a cane to walk when you’re 50,” Dr. Ralph Lanciano told Mario. Mario’s 50th birthday was bittersweet. On July 9, 2005, he and Ann went out for dinner at the Library 2 Restaurant in Voorhees. He still remembers there was a setting sun as they waited for Ann’s sister and her husband to arrive. For a time, Mario made out silhouettes of people, and even when he was first started being coached in blind tournaments a few years ago, he often could get a feel for where the pin was during putts by having his coach stand at the flag wearing white shoes to contrast the green grass. There is no cure for Mario’s condition, but he gained hope right around his 50th birthday by qualifying for an experimental study at Johns Hopkins Hospital in Baltimore. A chip placed into his left eye hopefully would regenerate retina growth. The test not only failed, but that’s when Mario stopped being able to tell night from day in his left eye. Mario is dealing. He gets around his home well, often using walls to navigate, although he still has his share of falls even with a cane. Steve drives Mario to his ball again, this time for an approach shot. “Exactly 100 yards?” Mario asked. “What’s the front of the green?” Mario asks. Mario pulls out a pitching wedge, then reaches down to get a feel for how damp the grass is. “It’s going to take something off it,” Mario counters. Mario takes his practice swing, gets lined up … whack. “Little bit to the right,” Steve said. The ball comes out of the air on the green, rolling to a stop about 35 feet to the right of the pin. The toughest thing about being blind, Mario says, is losing his independence. As much as he does, he wants to do more. He misses driving and hates having to rely on someone to get somewhere. A low point was when he stopped working for awhile at age 40. Just like when he was sighted, Mario works in computers, only now he uses computers and software that talk. Mario pulls out the belly putter he’s still getting used to, walks with Steve up a little hill onto the green and then to the flag. Mario taps the middle of the pole with his putter, making a clinging sound, then counts off steps until reaching his ball, again while holding Steve’s arm. “OK, 12 steps, up a hill,” Mario says to himself. He adjusts his feet every so slightly, then gently makes contact. The ball rolls slowly toward the hole and looks good until curving a hair left and stopping 4 feet short. Mario was born in 1955 in Teramo, Italy, which is 93 miles northeast of Rome on the Adriatic Coast, and he came to America a year later when his parents settled in Camden. His father worked as a tool and die maker, and young Mario quickly became bilingual, learning English and Italian. Mario has returned to his homeland about 10 times since, the last visit coming last May with his sister. They visited two uncles for closure. The ball is a short putt from the hole. “Little over a step (away),” Steve says. Mario reaches an arm out and feels the flag, then grabs it and sets it down out of the way. Steve backs up, tells Mario to adjust a little to the right, then tells him “too much.” Another adjustment corrects that. Mario takes his time, putts and … the ball rolls slow and straight, then drops in. Golf didn’t become a big part of Mario’s life until he started losing his sight. He took it up at age 30 and over time it became a passion. Mario and Steve, 18 years apart in age, have become close in their six years together on golf courses. Mario is greatly appreciative of the time and help, while Steve enjoys the company and admires everything Mario accomplishes on and off the course. Best of all, they have fun together. Steve, who also is married with two sons, started volunteering a little prior to meeting Mario when showing up for an early golf outing and hearing coaches were needed that day for a blind outing. A favorite story Steve tells of Mario is from when they were at their only national tournament together a few years ago in Edgmont, Pa. It was raining like the dickens and Mario just refused to take cover. Mario persevered and ended up finishing third. “I tell him all the time he’s the third-best coach in America,” Mario said. To Ann Tobia, Mario is the No. 1 spouse, and despite how their lives have changed, some of their best times have come since he’s lost his sight. Mario Tobia hoped for a better finish this year. The Mount Laurel resident competed in the United States Blind Golf Association national championship earlier this week. Tobia placed third among the 25 golfers in the field at Middle Bay County Club in Oceanside, N.Y.
Tobia totaled 47 points in the two-day tournament that uses the Stableford scoring system. That was one point behind the runner-up and 18 points behind champion David Meador. Tobia improved upon his score, if not his finish, from last year. He was second with 44.25 points in 2011. The USBGA championship is scheduled for 36 holes, 18 each day. Because of wet conditions on the Long Island course, this year’s tournament was limited to nine holes on the first day. Tobia finished the first round with 13 points, then gladly accepted help from his coach, older son Matt Tobia. Michael Tobia also coaches his dad in some tournaments. 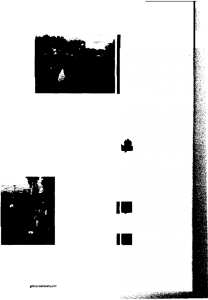 Golfers are accompanied by coaches, who “act as their eyes” (according to a USBGA news release). Matt saw some things that needed correction. Mario scored 34 points, second most on Day 2 (Meador scored 45). Golfers competed in three categories. Tobia was one of 16 players in Class B1 (totally blind). He began to lose his sight in his early 40s due to retinitis pigmentosa. Classes B2 and B3 are for less visually impaired, the difference being degree of impairment. Posted: Sunday, August 5, 2012 12:00 am | Updated: 9:02 am, Mon Aug 6, 2012. Mario Tobia had to quit his job. He had to give up his license, too. His condition, retinitis pigmentosa, was slowly deteriorating his eyesight. Before, he was an athlete, a hard worker, a family man. He was only in his early 40s. His life was changing for good, and there wasn’t a damn thing he could do about it. That’s when he found refuge in a small white ball he could just about see. Tobia, a Mount Laurel resident, is now 57. His eye condition has left him completely blind for several years. But he still finds refuge in that little white ball, even though he can’t see it at all anymore. Tobia will compete in the 67th annual United States Blind Golf Association National Championship on Aug. 6-7 on Long Island, N.Y. Last year, he finished in second place, just four strokes behind the leader. This year, he wants to win. Tobia has always been a competitor. He was an athlete growing up. He played several sports at Cinnaminson High School. He even went to La Salle University on a track and field scholarship; he threw the discus. But golf? That was for old guys. But the real reason Tobia started to play was because his eyesight was starting to go in his early 30s. The sports he once played — basketball and tennis — became harder and harder. He could at least play golf. But as his eyesight deteriorated further, he eventually had to give up driving — the only way he had to get to the course to play with his friends. Once he stopped driving, he left his job at a publishing company, too. He was at home trying to find a job suited for a blind person and there wasn’t too much available. To make matters worse, Tobia was stuck in his house. The day-to-day socialization of a normal life had followed his eyesight into nonexistence. That’s when Tobia, in his 40s at the time, started attending support groups for visually impaired people. He hadn’t golfed in a few years, after he wasn’t able to drive. But at one of the support group meetings, he heard someone mention golf for the visually impaired. Naturally, Tobia was interested, so he checked it out. He joined the Middle Atlantic Blind Golf Association and began heading to several more-casual golf events. When he first joined the group, he had some of his vision left, which he said made it a little easier. He could still make out the ball — at the very least, he could see his target. Matt, 28, and his younger brother, Michael, 22, have both been Tobia’s coach at several tournaments. Basically, they are now his eyes. Matt remembers his dad teaching him to play golf when he was just 12 or 13. Golf has become a family game for the Tobias. And it’s not just because Mario can’t see. It gives the family a common bond, just like any other family. In fact, Tobia said his sons have become pretty good at the sport, much better than he ever was — with or without sight. Matt Tobia will be his father’s coach this week on Long Island. It will give father and son a chance to reunite. Matt no longer lives in South Jersey. “I don’t cut him any slack,” said Matt, who added that Mike is the softy of the two. There are different division for blind golfers: B1, B2 and B3. B1 is where Tobia plays. That’s the completely blind group. When he started golfing as a visually impaired person, he wasn’t a B1. And even after he was completely blind, he waited for a while before he joined the B1s because he wanted a challenge. Tobia completely lost his sight about seven years ago. The last time he remembers seeing a face was at his 50th birthday party. “That’s the last time I saw my wife’s face,” he said. He’s looking forward to this week’s championship and thinks he has a chance to do really well. He said he normally shoots much lower in casual rounds than he does in competitions. The nerves have something to do with it. Most people would think it’s enough that a blind man is playing golf. Tobia, who now works for the Philadelphia Department of Veteran Affairs teaching visually impaired people how to use computers, doesn’t care much that he’s blind. He’s a man. He’s a husband and a father. He’s a golfer. “A lot of people don’t believe it,” Tobia said. “Then, they question what kind of golf you play. I just play golf.”. Patrick Malloy never has known what it’s like to have the use of his eyes. That’s hardly kept him from leading a pretty normal life, including playing golf. And sometimes even helping others who can see. Take his first day at Council Rock North High 4 years ago, where he was the only blind student. He smiled at the irony. Welcome to his world, which has been built around opportunities rather than barriers. Starting next month, the 18-year-old Malloy will be a freshman at Muhlenberg College, where he admits he might finally have to learn how to cook. He wants to become an attorney, perhaps specializing in disability law. In June, he was awarded a $10,000 scholarship from the Royal Bank of Scotland as its male Achiever of the Year for his involvement with the Philadelphia Chapter of The First Tee program, where he’s a participant and intern/mentor. The thought of him being anything but mainstream never remotely enters his equation. Apparently, just about anything he takes on. Smith has been working with Malloy for a decade, or ever since Patrick decided to give the game his late grandfather loved a try. Smith was working at Yardley Country Club at the time, and they hooked up through the Mid-Atlantic Blind Golfers Association. Three years ago, he moved to Walnut Lane and brought Malloy with him. Two days a week, he helps Patrick’s father, Mike, with the commute from Bucks County. A member of the National Honor Society, Malloy has put into Braille multiple copies of TFT curriculum, which incorporates nine core values. He also has created programs for the Overbrook School for the Blind and St. Lucy Day School for the Visually Impaired. Yet it’s the lessons he imparts as a member of TFT coaching staff that are particularly inspirational. “I always tell the kids, ‘I can’t see the golf ball, but that doesn’t mean anything to me,’ ” Malloy said. “As long as I have a good, consistent swing and I’ve been lined up correctly, I’m going to find that ball. I’m generally met with surprise at first. That’s understandable. Once they actually see me out there, they realize this is a guy who happens to be blind, not a blind guy who happens to be a golfer. Not only do they learn about golf from me, they learn how to accept a blind person. I do everything they do. “I let them ask me any question they want to. Someone wanted to know how I could see if I was blind. I said, ‘Well, I don’t see with my eyes like you do. I use my other senses, and I can picture things in my head.’ There’s something you could never have told a kid to ask. They just came up with it, out of the blue. I just remember thinking it was a great question. It’s certainly a distinct one. “We’re trying to create better individuals, through life skills. How does he not fit into every single one of the values we have? And how can he not relate that to every one of those kids? Young men and women want to share their story. So it becomes easier for them, because that kind of opens things up. They all know perseverance. For some it might be making a bus every morning. For Patrick, it was being able to mainstream, because that’s what he wanted to do. They see him, and maybe realize that their situation isn’t as hard to overcome as they think it is. That’s why he’s so effective here. He can really bridge that gap. And not because he has the ability to smack one out there, or curl in a tricky 15-footer. Golf is merely a part of him, albeit a revealing one that’s helped set him apart. Now, and hopefully for as long as he wants it to be. “The main thing is, I do everything that my friends who are sighted do,” Malloy stressed. “I’m really proud that someone would think what I do is special and recognize that. At the same time, I don’t know any different. It’s the way that I’ve been doing things my whole life. For me, it doesn’t matter if they say I’m special or not. “I never felt sorry for myself, not at all. I feel that if you look at your life in that sense, you’re going to go through it saying, ‘Why didn’t this happen?’ Or, ‘Why didn’t that happen?’ You’re always going to live an unhappy life. Then nothing good is ever going to happen. “For me I say, ‘OK, I can’t see, but what else can I do?’ I have four other working senses, and I can play golf, and I can go to a great college. What do I really have to be upset about? I’ve never been one to really worry about things. If it sounds tough, I’ll deal with it. I think of college more as an adventure. You never really learn about stuff until you get out there and experience it. I can probably burn food just as easily as a sighted person. Normal? How about anything but. “People can be very fearful of the blind,” acknowledged his mom, Eileen. “Patrick has never approached it as a tragedy. It’s just what it is. He’s realistic about accomplishing his goals. Handicap? Sure sounds as if Patrick Malloy should be the one giving out strokes at the opening hole to try and make for a pretty even match. Drexel Hill resident Jude Vogelman has been playing golf since he was 5 years old. He also happens to be legally blind. Jude Vogelman of Drexel Hill has always enjoyed golf. So it’s no surprise that he has a full set of clubs, seven in all, and his own golf balls. And he plays golf whenever he can. He does this even though he is legally blind and has braces on both legs because of cerebral palsy. But that has never stopped him. Now 20, he started playing golf at age 5, and loved it from the start. His involvement in golf began when he joined a unique program for blind and visually impaired youngsters. The Blind Junior Golf Program, which is sponsored by the Middle Atlantic Blind Golf Association (MABGA), is open to all those in the tri-state area — and even beyond — who are visually impaired or totally blind and want to learn to play golf. The age range is 5-21. The program provides the youngsters with equipment — golf clubs, balls and golf bag — and regular lessons with a PGA golf pro, all free of charge. MABGA recently received a grant from The Philadelphia Section PGA and The Greater Philadelphia Junior Golf Foundation specifically to support the Junior Golf Program. Twice a year, the junior golfers get together to play golf on a nine-hole golf course at the Overbrook School for the Blind. At this golf clinic, they engage in several competitions, while family and friends cheer them on and then enjoy a pizza party. The chip-and-putt golf course at Overbrook School for the Blind was designed by Norman Kritz of Cherry Hill, N.J., co-founder of the program. Kritz is not blind, but he has a long-standing interest in community service, especially for youth. The other co-founder is blind golfer Gil Kayson of Elkins Park, Montgomery County. Jude Vogelman started participating in the program at age 5. At the time, he was the youngest person to ever join. It all began when his mother, who is the parent liaison at Overbrook School for the Blind, brought home an announcement about the program and encouraged him to join. “He’s in a family of athletes,” she explained. His father, Darren, is an avid golfer. His three siblings are all involved in sports. “So we wanted Jude to have his own activity,” said his mother. Jude agreed to join the program even though his disabilities go beyond his legal blindness. He also has cerebral palsy and mild mental retardation, all caused by strokes to the fetus before he was born. When he attended his first golf outing, Jude was using a wheelchair and a walker. Now, his cane and braces give him enough support. He also found a way to stand up rather than use his wheelchair. He’d use the golf club for support. “Then he’d swing and fall down, but he would just laugh, get up and do it again,” relates his mother. Of course, there are necessary modifications for visually impaired golfers. When Jude is out on the green, his coach places the ball on the tee, and positions him behind it, telling him the approximate distance to the hole. But then it’s up to him to swing and follow through. Jude’s positive experience with golf has led him to try other sports. At Overbrook School for the Blind, he’s on three teams: Swimming, track, and goal ball, a sport that is similar to soccer but geared specifically for the blind and visually impaired. Golf has been a favorite activity for years. But Jude’s golf career was interrupted at age 11 when he had major surgeries on his leg. But by age 12, he eagerly resumed the game he loves. Besides playing with his father, he sometimes played with his older brother, Blaise. And of course he always attended the twice-a-year golf clinics offered by the Blind Junior Golf Program. He was such an active participant, that several years ago he was chosen as one of only two members to attend the dedication of a handicap accessible golf course in Washington, D.C. The previous year, he was invited to a golf clinic organized by the LPGA (Ladies Professional Golf Association) held at the Manhattan Country Club in northern New Jersey to raise money for spinal cord diseases. The late Christopher Reeve was one of the celebrity guests who attended. On June 8, Jude graduated from Overbrook School for the Blind. And the day before graduation was also an exciting one. While attending a Phillies game, the team gave special recognition to the close relationship the late, great Robin Roberts had with young blind athletes. To honor that connection, two students from Overbrook School for the Blind were chosen to represent the school’s student athletes. The two were Jude Vogelman and Kim Novak, and they were out on the field before the game began. This summer, Jude will still be involved in sports. The family spends summers in North Wildwood, N.J., where Jude has worked for the Department of Recreation for the past two years, helping to supervise recreational activities at the playground. He’s doing so again this summer. He’s even practiced his swing on the beach, and it’s still getting stronger. “And his long ball is fabulous,” said his mother. For her son, the program has been a life-changing experience. For information about the Blind Junior Golf Program, contact Gil Kayson, 215-884-6589, sasgil@verizon.net or Norman Kritz, 856-428-1420, jerrynorman2@comcast.net. For information about the Middle Atlantic Blind Golf Association (for adults) visit www.mabga.org. Xavier and Alexaliz Melendez are no strangers to life on the green. The two siblings, ages 12 and 15, often can be found on various golf courses around the Northeast Philly region. In fact, this Saturday, the duo will again be practicing their swings, attempting holes in one, and participating in varied contests. And they do it all despite a serious visual impairment. Xavier and Alexaliz will be attending a golf clinic that’s part of the Blind Junior Golf Program, a unique program for blind and visually impaired youngsters. Sponsored by the Middle Atlantic Blind Golf Association, the program is open to any youngster in the tri-state area — and beyond — who is blind or visually impaired and wants to golf. It provides them with equipment — golf clubs, golf balls, golf bag — plus coaching with a PGA golf professional, all free of charge. Twice a year, the young golfers get together to golf on a course at the Overbrook School for the Blind. Here they engage in several competitions, while family and friends cheer them on. Afterward, everyone enjoys a pizza party. Xavier and Alexaliz have attended past clinics and look forward to Saturday. “I like entering the contests,” said Alexaliz, who proudly noted that so far she has won two trophies, having claimed the “Closest to the Pin” competition in 2009 and ’10. The youngster added that she also enjoys meeting other visually impaired and blind youngsters who, like her, play golf energetically despite their disabilities. For Xavier, the putting contest is his favorite activity. “And the coaches are really nice,” he said. Both brother and sister have the same degenerative condition, called retinitis pigmentosa. Because Xavier is older, his condition is now more advanced. He has no peripheral vision — only central vision. Only one in 35,000 children has this disease, and there’s a 30-percent chance that it is inherited. The Melendezes’ oldest son, Steven, has normal vision. So his parents were taken by surprise when Xavier developed retinitis pigmentosa. He was 5 before he showed signs of visual impairment. By then Alexaliz had been born, and in time she too developed the condition. Xavier is in ninth grade at the Overbrook School for the Blind, and his sister attends the Overbrook Educational Center, designed for blind and visually impaired youngsters up to grade six. Both enjoy varied activities in their respective schools. Xavier especially likes playing basketball and wrestling, and his favorite academic subject is math. He uses computers at school and at home; they are especially geared to the needs of visually impaired users. Alexaliz’s favorite class is computer lab, and second place goes to social studies. The versatile youngster plays the xylophone and the recorder. And she enjoys playing Scrabble on Fridays. “I’m really good at it!” she declared proudly. Their parents learned about the golf program when Xavier brought home a flier from school. “I thought it was a very interesting idea,” said Alexis. His son and daughter liked the idea too, and so they soon were fitted with their own set of golf clubs and attended their first clinic. “I was surprised and amazed to see how the kids in the program could drive the ball so far,” Alexis explained. The nine-hole chip-and-putt golf course on the campus of the Overbrook School for the Blind was designed by Norman Kritz of Cherry Hill, N.J., co-founder of the Junior Blind Golf Program. Kritz is not visually impaired but he has a longstanding interest in community service, especially for youth. The other co-founder is blind golfer Gil Kayson of Elkins Park. The youngsters play on this golf course twice a year, in fall and spring. In between, many of them practice at home or undergo coaching sessions. Of course, there are modifications for blind or visually impaired golfers. When they play, the coach places the ball on the tee and positions the player behind it, telling him or her the approximate distance to the hole. But then it’s up to the player to swing and follow through. “I had some trouble at first because I didn’t know how to play,” said Alexaliz. “So at first I was a little nervous. But my coach taught me, and I thought it was fun. Meanwhile his son and daughter are ready and eager for Saturday’s golf activities. Associated Services for the Blind and Visually Impaired (ASB) hosted their Annual Board Meeting on October 21, 2010 and recognized two outstanding organizations for their achievements on behalf of the blind and visually impaired community. The first award was presented to Art-Reach, a Delaware Valley nonprofit cultural service organization that helps underserved audiences, including people with disabilities, at-risk youth, the economically disadvantaged, and the elderly in need, to experience arts and cultural programming and serves as a community resource by increasing accessibility to cultural venues and events. Over the past few years Art-Reach has provided ASB’s clients with discounted tickets for admission to museums, cultural institutions and arts performances that are pledged by arts partners. This well-loved program has given clients the opportunity to enjoy the same activities as their sighted peers. Michael L. Norris, Executive Director of Art-Reach, accepted the award. The second award of the afternoon was presented to the Middle Atlantic Blind Golf Association (MABGA), a non-profit organization that provides blind and visually impaired men, women, and children the chance to learn the game of golf and the rewards it offers. Each year, the MABGA provides a blind golfer demonstration at ASB’s Annual Vision Cup Golf Tournament. This demonstration is not only inspiring to attendees, but also informative. James Ganter, President of MABGA and Vision Cup Demonstrator, accepted the award. The accomplishments made by both of these organizations on behalf of the blind and visually impaired community are commendable and ASB is pleased to honor such esteemed associations. San Antonio’s Bruce Hooper, down by six strokes entering Tuesday’s final round, posted a tournament-best 5-over 76 to retain his title in the B-2 division of the American Blind Golf Championship at Brackenridge Golf Course. Hooper’s 168 total for the two days was eight strokes up on first-round leader Mark Arnold of Ohio. Hooper, a former world champion in B-2 — for those with limited vision — has now won four straight national crowns and eight overall. In the B-1 (totally blind) division, New Jersey’s Mario Tobia finished with a 102 for a 215 total, enough to defeat Brad Eaton of Massachusetts by 32 strokes. In the B-3 category, Bruce Peterson came from behind with an 87, finishing at 174 and nipping runner-up Charlie Adams by a stroke. A fundraising event will be held today, again at Brackenridge, to benefit the San Antonio Lighthouse for the Blind. If you think that a golfer needs to see what he’s doing, think again. Or ask Narberth resident Paris Sterrett. He’s been coaching blind golfers for 19 years, sharing the pleasures of the game he loves with those who need his help to get the ball into the hole – including a man who did just that with only one swing. From April through October, Sterrett drives a player to the course, aligns him, describes the holes, gives distances, suggests clubs and watches the ball’s progress. Seven years ago he was coaching an 89-year-old golfer from Wynnewood, Larry Ruttenberg. He told him that the hole was 137 yards away, over a ravine. Ruttenberg asked for his 7-wood and promptly hit a remarkable hole-in-one. The event made national news. Sterrett, 68, coaches with the Middle Atlantic Blind Golf Association, which has been coaching the blind and visually impaired since 1948. In addition to coaching individual golfers, he also volunteers as a starter and coach for MABGA junior blind programs at the Overbrook School for the Blind. The school has its own nine-hole course complete with a sand trap and a pond. It sponsors putting and closest-to-the-pin skill contests in which every child receives a prize and trophies are presented “There is nothing finer than to see the expression of a blind child when he or she is called forward to receive a trophy,” Sterrett says. Sterrett grew up in Rhode Island and earned his master’s in rehabilitation counseling from SUNY Buffalo. He met his wife of 40 years, Joan, in graduate school. Sterrett worked with disabled veterans as a counseling psychologist at the Philadelphia VA for 25 years until he retired in 1995, a career he describes as “very rewarding.” The Sterretts have lived in Narberth since 1973. Helping people and volunteering is something of a family tradition with Sterrett. His father was the executive director of a community center for children in Providence, and his mother was a very active volunteer with her church, the homeless, a senior citizens’ center and the local library. And Joan is an active volunteer with the Narberth Library, for which she was profiled in this column several weeks ago. Sterrett plays golf early in the morning four times a week. He is a member of the Cobbs Creek Golf Course and describes his group of 10 colleagues jokingly as “ORFs (old retired farts).” He says that his biggest thrill in golf has not been his own three holes-in-one but providing CPR to a fellow player. At the hole farthest from the clubhouse, the player became disoriented and fell over his pull cart and, Sterrett says, “turned pink, blue and purple almost as fast as you could say birdie.” Sterrett immediately started CPR chest compressions and, after eight to 10 tiring minutes, the player’s color started to return and he revived. By the time the 911 crew arrived, he was sitting up. He spent 10 days at Lankenau Hospital, where he received a new pig valve and a bypass; now, three years later, he’s back playing with the ORFs. Sterrett says that the joke among his golfing friends now is that all of them want to play in his group, should they suddenly need his CPR skills. Seventeen years ago Episcopal Academy’s head coach asked Sterrett if he would coach JV golf there, which he’s been doing ever since. “It’s fun being with the students with multiple skill levels,” he says, and he emphasizes to this writer, “make sure you put in how much I enjoy it,” In addition to coaching, Sterrett discusses subjects with students that are not golf-related such as college searches, current events and complexities. And he’s not above telling the students frequent riddles and jokes. Sterrett enjoys gardening, and has had his own plot at Haverford College for 33 years. He also loves to watch high-school and college basketball, and has sat through as many as eight high-school tournament games in one day. (He never attends professional basketball games, however.) He and Joan love to travel, and he would like to cruise the Panama Canal or visit Costa Rica or Nova Scotia. And Sterrett loves living in Narberth. He volunteers for NarbEarth Day in April and, with Joan, organizes social events for his block. “Somehow we came across this gem of a town that we love,” he says. For more information about the Middle Atlantic Blind Golf Association, visit www.mabga.org. Jack Herbert, of Wallingford, competes in the 65th United States Blind Golf Association National Championship. EDGMONT — With raindrops clinging to his argyle sweater and sea foam green slacks, Jack Herbert split the soggy first fairway at Edgmont Country Club with a healthy thwak of a driver. His approach shot was equally solid and likely would have hopped up onto the green on a drier day. On Wednesday, however, it never had a chance, plugging in the mud some 15 yards short of the putting surface. “I’ve got some work to do,” Herbert said as he pulled a sand wedge from his golf bag and walked across the saturated sod to his Titleist. Two lackluster shots followed before he put a pure stroke on a 12-foot putt and pumped his fist after listening to it tumble into the hole like a barrel over Niagra. “That felt pretty good,” he said while walking off the green. As Herbert made his way around the golf course, it was tough to determine what was more impressive — that he is 89 years old or legally blind. “At my age, I feel like I can do anything,” said the longtime Wallingford resident, who served in the Navy aboard a minesweeper in the Pacific Theater during World War II. Anything, at least, that doesn’t require central vision. Herbert’s vision was cut down 10 years ago by wet macular degeneration, a condition that occurs when abnormal blood vessels form behind the retina and start leaking blood and other fluid into the macula. In less than three months, he lost the ability to see what was in front of him. Herbert was among the least impaired of the 21 golfers who participated Monday and Tuesday at the 65th United States Blind Golf Association National Championship at Edgmont. His two-day score of 245 was a few dozen strokes higher than he normally shoots, but rain, thick rough and nerves have a way of piling on. Edgmont’s support of blind golf dates back to 1967 when club President Nazzareno “Nazz” Mariani and head pro Tanini “Tiny” Pedone welcomed the third annual International Blind Golfers Tournament to the course, which had opened just four years prior. Both men have died, but Mariani’s daughter Pam said their commitment to blind golfers remains very much in tact. The USBGA separates golfers into three site classifications, ranging from those who are totally blind to people like Herbert who are legally blind but have some usable vision. Herbert’s coach for the championship was his neighbor of 50 years and longtime playing partner, Jerry Axel. A state pole vaulting champion in 1940, Herbert actually played to a 6-handicap at one time. “I’ve shot several 73s, but never shot a 72,” he said. And while those days may be gone, he still plays 40-plus rounds per year with the Mid-Atlantic Blind Golf Association and managed to shoot three rounds of 100 or better to qualify for the national championship. And what if the coach forgets to give feedback? Despite the extra strokes and spotty weather, Herbert and Axel got around the course just fine Tuesday and finished their round under a warm sun. The day was capped with an awards ceremony, catered lunch and the standard amount of post-round ribbing about terrible shots that were plainly evident even if not seen. Pam Mariani commended the players for pressing on in the elements and said blind golfers will always have a home at Edgmont. The USBGA national champions for 2010 were Bob Andrews of Tallahassee, Fla., and his coach Joe McCourt in the B1 division (for golfers who are totally blind); Ty Thompson of Lexington, Ky., and coach Marty Jensen in the B2 division (visually impaired) and William Pease and coach Maurice Pease Jr. in the B3 division (less visually impaired). George Pilz takes a practice swing, places his golf ball on the tee, then stops to listen as his coach describes the fairway, trees, sand traps, and water hazards before them. Helen McIntyre, his coach – and eyes – moves in to help Pilz line up his club and steps aside. The 68-year-old golfer steadies his feet, pulls back his driver, and – thwack – sends the ball flying down the center of the fairway of Edgmont Country Club’s first hole. “That is straight out there, George. Good shot,” McIntyre says. She walks over to Pilz, who puts a hand on her elbow as the two head toward a golf cart to continue his practice round. On Monday, Pilz will join about two dozen of the best blind golfers in the country, and one from Canada, at this Delaware County club for the first of two days in the United States Blind Golf Association’s 65th National Championship. McIntyre, who has been coaching blind golfers for 20 years, says it is her job to give a “visual image” of the course and set the angle of the club behind the ball. The rest is up to the player. Pilz relies on that vivid description from his coach when hitting the ball. He can hear the water in the creek and feel the breeze, but he can’t see how far away the tree line is, or if the fairway slopes left or right. Pilz, a lineman for Philadelphia Electric before injuries from a car accident stole his sight, was introduced to the sport while a Veterans Administration rehab patient in the early 1960s. Now retired after a career with AT&T and his own business, Pilz spends two or three days a week playing more than 40 courses around the region with his golfing buddies in the 100-member Middle Atlantic Blind Golf Association, which includes part-time coaches. Reaching the green on this morning at Edgmont, Pilz paces off the space between the ball and the pin with McIntyre at his side – his way of visualizing the slope and distance. The two then mull the possibilities for his next shot. “I’m going to say it’s going to break right,” advises McIntyre, 66, of Glen Mills, who will be a tournament volunteer. 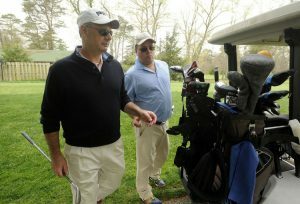 This is not the first time Edgmont Country Club, on West Chester Pike in Edgmont Township, has held a blind-golf event. In 1967, comedian Bob Hope hosted the Hope for the Blind tournament at the club. In 2007, the USBGA held its 62nd National Championship there. The club, built on the rolling grounds of an estate more than 200 years old, has long supported athletic events for the blind, said Pam Mariani, the club’s general manager. 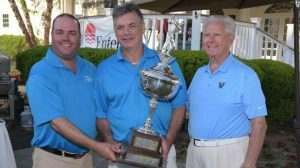 Its late founders – her father, Nazzareno “Nazz” Mariani, and Tanino “Tiny” Pedone – brought the first event for visually impaired golfers to the course in the early 1960s, Mariani said. It became their passion. The more-than-400-member club also hosts events for the Middle Atlantic Blind Golf Association, which serves the Philadelphia region and Delaware. On Wednesday, it will host a golf clinic for vision-impaired youths. Also preparing to compete in the national tournament is Mario Tobia, 55, of Mount Laurel, who hopes the mini-competitions he plays with the Middle Atlantic group will help him get over the jitters. “If I am playing well, I can still hit in the 80s,” Tobia said. But, he said, with a national competition and officials watching, he expects to throw 10 strokes onto that number. Tobia took up the sport in his 30s before retinitis pigmentosa gradually took his sight. He didn’t let blindness deter him. “Golf is something I can do without sight,” said Tobia, who trains people to use adaptive-technology software for the Department of Veterans Affairs in Philadelphia and the New Jersey Commission for the Blind and Visually Impaired. But he admitted it was “an adjustment” to hit the ball well without seeing it. Tobia has played four national tournaments despite – or perhaps because of – the stress it produces. The golfers compete in three categories, depending on the level of their impairment. Tobia and Pilz will compete in the totally blind category with Sheila Drummond, 56, president of the USBGA and a tournament organizer. Drummond gained international attention when she hit a hole-in-one in 2007. Drummond, who couldn’t imagine chasing a little ball around a golf course when she could see, hit the perfect shot on a par-3 hole at her home course, Mahoning Valley Country Club in Lehighton, Pa.
“It was crazy,” Drummond said of the TV and newspaper interviews that followed. She relies on her other senses to hear and feel if the ball was hit correctly. “Sometimes if you hit it really, really good, right in the sweet spot, it almost feels like you missed it,” she said. Back on the green of the third hole at Edgmont, McIntyre holds up a putter to “plumb bob” a six-foot shot for Pilz. “Right to left” is how it will break, they agree. No practice swing this time, Pilz steps up and hits. The ball rolls toward the pin and just misses. He taps it in, and the two move on to the next hole. On October 10, 2009, the Middle Atlantic Blind Golf Association (MABGA) held a junior golf clinic for blind and partially-sighted children at Philadelphia’s Overbrook School. The twice-yearly clinics are coordinated by University of the Sciences alumnus Norman Kritz P’51and typically draw more than 70 participants, ages five to 21, from Delaware, Pennsylvania, New Jersey, Ohio, and Indiana. When Kritz anticipated having more children than coaches, he called upon his alma mater and 12 University of the Sciences students stepped-up. The students joined several MABGA members and friends of the program at Overbrook School to help coach the visually-impaired children. On a specially designed and modified course, Brittany Heller PharmD’13, Brittany Maulen PharmD’12, Lauren Frascella PharmD’13, Jade Kozuch PharmD’13, Justine Campo Undec’12, Kerri Bossert DPT’14, Dorothy Zissler PharmD’14, Alyssa Cybulski PharmD’14, Amanda Jayne Brown DPT’13, Melanie Narbut PharmD’14, Kristin Capece PharmD’13, and Sherri So PharmD’13 spent hours teaching the students the basics of golf, such as proper stance and club grip. The children competed in closest-to-the-pin pitching and putting contests, and the day wrapped up with a pizza party and trophies for the winners. On Friday, August 21, the Middle Atlantic Blind Golf Association held their annual Pro Am golf outing at the Philmont Country Club’s south course in Huntington Valley, Pa. The event matches blind golf members from the MABGA organization with local golf professionals in an alternate shot format for a wonderful day of golf. This outing includes awards for the winners of the visually impaired and blind divisions and a catered luncheon at the Philmont clubhouse. Philmont has hosted the Pro Am outing for MABGA since 1998, and prior to that at White March Valley for one year and at Ashbourne Country Clubs for twenty years. In the totally Blind category, George Pilz and Darryl Lock the head pro and general Manager at Skippack Golf Club won with a score of 88. George was coached by John Lucas, a friend who was visiting from Louisiana and coached George in last years USBGA National Championship in Tunica, Mississippi. George was a little disappointed with his performance and blamed his score on too much celebrating with his visiting coach from Louisiana. George is very competitive and is always looking to improve his golf game. Last years raining champion, Jim Hunt & John Carson, independent Golf Professional took second place with a score of 90. The winner in the Visually Impaired division was Mario Tobia and his golf professional Patrick Shine, Director of Golf at Commonwealth National Country Club and was coached by Steve Rodos, Mario’s regular playing partner. Mario won the coveted Founders Cup trophy with an eye opening score of 79. Mario thought that he and his pro could have shot a much better score as 5 or 6 putts rimmed out of the hole. We expect better scores in the future, explained Tobia. Sounds like every weekend golfer reviewing his round at the 19th hole after downing a few beers. Mike Connell and his golf professional, Matt Faust, the assistant pro at Ben Salem Country Club took second place with another great score of 81. It seemed like the golfers and their pros are getting use to the course as both first and second place in this years event beat last years raining champions, Rod Ryan’, who shot a very respectable score of 82. George Pilz, the 2008 Men’s Senior National Champion and Mario Tobia, who took six place in last years B2, visually impaired division will both represent MABGA in this years National Championship on the historic Brackenridge Park Golf Course in San Antonio, Texas beginning October 12, 2009. The Middle Atlantic Blind Golfers want to thank Philmont Country Club for hosting this event and all the local golf professionals for their participation. We all look forward to next years outing and playing golf with the friends we made at this years event. THIS IS WAY easier than it was supposed to be. Then, suddenly, it isn’t. Suddenly, it is the hardest thing, the scariest thing, a thing of helplessness and impossibility. It is golf, and I am blind. To approximate the feeling and to appreciate the skills of blind golfers, I try my hand. George Pilz, 68, reigning senior U.S Blind Golf Association national champion and maybe King of Prussia’s most inspirational soul, gives me the chance. He lends me his coach. Pilz is preparing for the 32nd annual Corcoran Cup, the Masters of blind golf, a 14-player invitational tournament held Sunday at Mount Kisco Country Club in New York. So we meet last week on the practice green at Cedarbrook Country Club in Blue Bell, which this day is hosting the local Middle Atlantic Blind Golf Association tournament. He arrives an hour before one of his warmup tournaments to explain his methods. Pilz reaches out a hand for me to shake. He introduces me to Jerry Friel, his coach and, sometimes, he jokes, his scapegoat. Then Pilz demonstrates how he reads putts. Friel leads him from ball to cup and back again. From that, Pilz calculates not only distance but slight elevation changes and undulation and, from that, break. “I got 30 feet. A little right to left,” Pilz says. Friel agrees. Pilz drains two of the four putts. One miss lips out. Another is 2 inches short. “It’s working for me today!” he exclaims. At the time, I had no idea how much “It” was working for him. A few minutes later I watch Pilz play Cedarbrook’s first hole, a short, easy par-4. On the tee, Friel, a 58-year-old former co-worker from Phoenixville, aims him at a target, then steps back. Most coaches tee it up. Pilz doesn’t like that. “I get a better feel for it this way,” he explains. Pilz turns himself 90 degrees, puts a tee in the ground and places his ball on top of it. He retreats, unaided, rips off a couple of practice swings, and gives Friel the go sign. Friel places Pilz’ clubface behind the ball. Pilz adjusts his body and lets fly. His wounded quail darts into the rough 70 yards away. In snarly cabbage, his optimistic if unwise 6-iron dribbles another 20 yards. Now in the fairway, another poor 6 leaves him 103 yards from the pin. “Pitching wedge,” Pilz says, firmly. They go through the routine on the green: Pilz on Friel’s arm, escorted, walking from ball to pin and back again. “So, 48 feet, downhill, left to right,” Pilz says. Nothing from Friel. Maybe he’s thinking what I’m thinking: It really goes right to left. Pilz strokes his putt. It goes 49 feet. Left to right. Hard. I question my eyes and better understand why I seldom break 80. Friel lines up the tap-in. There are no gimmes in Pilz’ world. Excellence at golf – relative excellence, in a world where breaking 100 is astounding and a 5-hour round the norm – is just one more marker of Pilz’ journey. A high school dropout, he enlisted in the Air Force during the Korean War but never left the country. He knew a guy who knew a guy, so when he left the service he got a good job climbing poles for the Peco Energy Co. He was 21, living high and hard. That ended May 22, 1960. He and a buddy had a few drinks. Pilz was unbelted in the passenger seat of a car that got sideways and skidded into a tree. The driver was fine. Pilz woke up 2 weeks later with a ruined face he would never see again. His retinas detached when his head shattered the windshield. It could have been the end: no career, no degrees, no business, no golf. It was a beginning. If everyone contributed half as much. Pilz qualified for care at the Hines Blind Rehabilitation Center, a Veterans Affairs facility near Chicago. Four months after the wreck, he enrolled, and he learned – as much about the human spirit as about living blind. He came out able to type, able to cook, able to walk with a cane and able to read Braille. “I hate Braille,” he says, and with technology at his fingertips now it is superfluous. But like a radio operator who knows Morse code, Pilz reads a magazine in Braille every day to stay sharp. It is his way. He returned from Chicago, got a guide dog named Cloudy and enrolled in Temple University’s high school equivalency program. Simple, right? Well, getting to Temple every day meant walking down to the bus stop in Trooper, Pa., where there were no sidewalks. That bus dropped him in Norristown, where he hopped a train to Philadelphia, then another to Temple’s campus. Pilz had his diploma by January. He opened a wood-turning business out of his parents’ basement and that, along with a little golf (both skills he picked up in Chicago) was his life for the next 9 years. He never replaced Cloudy, his boon companion for 8 of them. The German shepherd was his starting point, but it was a crutch, too. “I needed to move on,” Pilz said. In the summer of ’69, Pilz met an AT&T executive who was dazzled with his capabilities. That fall, Pilz was working for the company, repairing telephones. That lasted for 25 years. It wasn’t all he did. An avid lunchtime runner, Pilz was part of the Olympic torch relay in 1984, the year his father, Ferdinand, died. Pilz carried the torch down the Ben Franklin Parkway and up the Art Museum steps where his mother, Edith, awaited him. It was Mother’s Day. Two years later Pilz graduated from Ursinus, where he studied business administration, finance (he manages his own investments) and industrial relations. His coworkers at AT&T wanted him to represent them during negotiations with management. When the company packed up, Pilz didn’t want to leave the area. He didn’t want to leave the house he and his mother had moved to 5 years earlier. So, he got his MBA at Saint Joseph’s and opened VisionTech, a company he ran out of the house. The company mated the newest technology for the blind with people who needed it. He trained sightless people from birth for new jobs; he trained the newly blind to do their old jobs again. With his VA connection, he tested new products and wrote reports on their merits. And he returned to golf. He had quit when he got the AT&T job – no time for such frivolity – but, master of his time once again, he rediscovered its joy. He shuttered VisionTech in 2001 when Edith’s health began a steady decline to her death at 92. He drilled a hole through a golf ball, unwound some line from a push-button fishing reel and strung the line through the ball. He adhered the ball and string with an epoxy filler and fixed a shuttlecock to the line behind the ball to create enough drag so the ball wouldn’t fly too far. He could smash drive after drive, feel the ball come off the club . . . then reel it in. He has a new practice cage in the yard now. He also has a fold-up treadmill on the back porch, a small, old Universal gym in the garage and the lean, hard body of a man many years his junior. He is re-evaluating that stance. After Pilz putts out on No. 1 at Cedarbrook, Friel walks over to me and secures the blindfold around my eyes. It is the complete darkness of George Pilz’ life. I never see the par-5 second hole as we drive up to it. Like Pilz, I exit the cart on my own. Like Pilz, I pull my own club (the driver was easy to find) and put my left arm on Friel’s right. Despite Friel’s warning, I nearly trip on the stone curb step-up from the cart path to the tee. He aligns me. I turn, put a tee in the ground, put a ball on top, step back, take a practice swing . . . and nearly fall over. I widen my stance for balance. I take another swing, slower. Better. Friel leads me forward, to the ball. I adjust my body to the club’s placement. It is time. Taking the club back – that’s a little difficult, like dipping a toe in cold, dark water. But once back, coming through is easy. Really. Just keep your balance. And I can play a little. Trust the swing? When you can’t see the ball, you have no choice. I pop it up, maybe 80 yards. But, hey, contact is contact and straight is straight. Unlike many of Pilz’ competitors, I can’t see anything; to qualify for blind golf one must only be legally blind, which means some golfers have limited vision. Sometimes, they will pull their heads up early to try and track the ball in flight. “That sounded great!” Pilz says. I beam. Friel is less impressed. Even less so, when, feeling pretty confident, I shank my next shot, a hybrid 4-iron. I use the same club on the third shot, which I clobber. Friel is encouraging. Another try, same swing, same club, and I’m 15 yards short of the green, just in front, chipping for par. I flip it 30 feet past, but I’m on in five, a double-bogey in sight. Because putting is even easier, right? The first thing I’d seen was Pilz drop two of four from 30 feet. Thermonuclear dynamics in Chinese is easier. Putting is like floating in the ocean on your stomach and trying to spear minnows. Blindfolded. You have no bearings. You drift in space. You walk the putting line, but, come on, what is 10 paces on a blind putting stroke? Did I go uphill on the way back? Because everything feels uphill when you walk in the dark. Does it break left to right? Whatever. I’m having a tough time feeling my legs, much less subtle undulations. All you want to do is make contact. If you thought pulling the driver back was tough – well, that putter was in cement. I feel the sweat on the backs of my hands. My palms are already drenched, stealing the moisture that usually resides in my mouth. I can hear them breathing. I swear it. Because I’m not. Finally, I jerk something toward the hole. I feel contact. Then, silence. It’s 15 feet short. I got it halfway there. The next one was 10 feet past. The next, 7 feet past. This feels awful. The next, 2 feet short. Two stinking feet, and dead straight. Oh, Lord. “Doesn’t it sound great?” Pilz asks. Slowly, I remove the mask. It is a little like un-drowning. This next part is cliché. So what? I feel the soft morning breeze and the gentle sun’s warmth and I breathe it all in. I hear an orchestra of birds and a single-engine plane and the little hairs on my arm tingle. I remember the faces and smiles and the beautiful, beautiful skin of my two baby daughters and I think of how horrible it would be to never see them again. When I pulled up to the Walnut Lane Golf Club to watch Patrick take a lesson, he was indeed in gorgeous form, sinking 12-foot putts. Molloy, 16, is a sophomore at Council Rock High School. Unlike Mickelson, Molloy is blind. Club pro Dave Smith had never taught a blind golfer before, but didn’t hesitate to take Patrick on seven years ago when asked by a colleague working with the Mid-Atlantic Junior Blind Golf Association ( www.mabga.org). “You don’t need to see the ball to hit it,” Smith reasoned. Instead, they work by feel and foundation, rote and repetition. At one point, Smith lined up two-by-fours to create a lane so Molloy could perfect his stance and alignment. Later, Molloy squeezed a rubber ball between his arms to determine how far apart to keep them. Like any student, he learns by trial and error. Where did your follow-through end when you hooked the ball to the left? How did you position your hands when you drove it high and straight? Seeing is believingMolloy was one of the star attractions at last weekend’s annual junior blind golf outing at the Overbrook School for the Blind. All 35 of these kids made magic. Watching blind youngsters swing, miss, smile, listen, try again, and connect should make sighted players rethink throwing tantrums. Patrick Morris, a shy 6-year-old from Havertown, was back for his third year. It’s amazing he has time, between baseball and acting. “He was just inThe Wizard of Oz,” said his father, Dan Morris. Kristie Hong, 11, has peripheral vision and wants to tackle a sport. By the look of Kristie’s face, he might want to invest in some clubs. Norman Kritz, who is sighted, and Gil Kayson, who is not, founded the junior blind golf group in 1980. Any visually impaired youngster in Pennsylvania, New Jersey, or Delaware who wants to play receives free lessons and clubs – Kritz cuts them to fit after measuring each child. “A blind golfer can putt just as well as your typical bad sighted golfer,” joked group president Jim Ganter, who was playing alongside an 89-year-old blind man who shot a hole-in-one. Sensing my skepticism, Kayson told me about a Golf Digest test with 12 sighted golf novices, six of them blindfolded. Fun in focusFor the nine-hole scramble, Molloy was paired with Julia Procopio, a 17-year-old from Verona, N.J., wearing a pink “Princess” visor and matching magenta nail polish. She doesn’t play often – piano is her thing – but can see enough out of her right eye to know that Molloy, who was born blind, takes the game very seriously. On the final hole, Molloy chipped a respectable 25 yards onto the green. Contact Monica Yant Kinney at myant@phillynews.com or 215-854-4670. Read her recent work at http://go.philly.com/yantkinney. BVA life member George Pilz, Pennsylvania Regional Group, has taken first place in the Senior Division of the U.S. Blind Golf Association’s 63rd Annual National Championship Tournament. The championships were held September 22-23 at River Bend Links, a three-casino complex in Tunica, Mississippi. George, a totally blind golfer and a veteran of the U.S. Air Force, was quick to credit his USBGA coach, John Lucas of New Orleans, as well as Harry Heagy, head golf professional at Edgemont Country Club in Edgemont, Delaware County, where he regularly plays. Both men, he said, have teamed with him many times and have been instrumental in his golfing success. George faced several qualifying rounds through play in the Middle Atlantic Association in order to compete nationally with 20 of the best totally blind senior golfers in the country. His win and the subsequent crystal trophy presentation were especially emotional in view of a promise that his win had fulfilled. George was blinded in 1960 in an automobile accident. He attended the Central Blind Rehabilitation Center at Hines shortly thereafter and subsequently received a Bachelor’s degree from Ursinus College and a Master of Business Administration from St. Joseph’s University. George’s master’s thesis addressed the role of technology in mainstreaming the blind and visually impaired. He worked for the research division of Western Electric and its offshoots until starting his own company, Vision Tech, Inc., in 1991. Vision Tech addressed the technological needs of the blind and visually impaired. When athletes with disabilities compete, the media and spectators are so amazed that they sometimes overlook the athletes’ coaches and instructors. The athletes never fail to acknowledge the men and women who spend a lot of their personal time helping them succeed. Many of these dedicated instructors and coaches receive no monetary compensation. George Pilz, a King of Prussia resident, won the senior division of the United States Blind Golf Association’s 63rd Annual National Championship tournament Last month at the River Bend Links in Tunica, Mississippi. Pilz immediately credited Harry Heagy, Head Golf Professional at Edgmont Country Club in Edgemont, Delaware County. On Friday, August 22, the Middle Atlantic Blind Golf Association held their annual Pro Am golf outing at the Philmont Country Club’s south course in Huntington Valley, Pa. The event matches blind golf members from the MABGA organization with local golf professionals in an alternate shot format for a wonderful day of golf. This outing includes trophies for the winners of the visually impaired and blind divisions and a catered luncheon at the Philmont clubhouse. Philmont has hosted the Pro Am outing for MABGA since 1998, and prior to that at Whitemarch Valley for one year and at Ashbourne Country Clubs for twenty years hosted the event. Winner in the Visually Impaired division was Rod Ryan and his golf professional Dan Donohue, outside operations from Whitemarsh Valley Country Club. Rod and his Pro shot an 82 and tied with Mario Tobia and his golf professional, Patrick Shine, Director of Golf at Commonwealth National Country Club. Rod Ryan won the coveted Founders Cup trophy on a tiebreaker system where the two score cards are matched to each other starting from the number 1 handicap hole and working back through the number 18 handicap hole comparing scores to determine a winner. Rod was very gracious in accepting his award and even offered to share his trophy with the runner up. Not many people would be so considerate, but that just goes to show how he values friendship more than personal awards. Winner in the Blind Division was Jim Hunt and his golf professional Julian Collie. Julian is an independent, unattached Pro who is starting a youth instructional school this fall. Jim and Julian shot a whopping score of 85. Jim did not have to make the hard decision of sharing his Founders Cup Trophy, as his nearest competitor was more than seven strokes back. The National Blind Golf Tournament was held this year at Edgmont Country Club. The four day event was orchestrated by skillful blind golfer Sheila Drummond of Leighton, PA who recorded a hole-in-one about six weeks ago and is coached by her husband, Keith. Sheila use to play in our local Middle Atlantic Blind Golf Association but the distance was too far to travel and play the Philadelphia and New Jersey courses. The thirty six players from All over the country had to qualify for this event. Next year it might be In Oregon. I was fortunate to coach Ty Thompson of Lexington, Kentucky who Had Scores of 99 and 97 to finish fourth overall in the very competitive Event. It was a lot of fun. The first day was a practice round, second day a scramble and then the individual competition the next two days. Our chemistry was excellent and Ty is an excellent player. Comcast Sports Net (#36) is airing some of the National event. It is on prime time on Sunday at 5:30 am, Monday at 4 pm and Wednesday at 11:00. My bucket hat gives me away but There are some nice interviews with Sheila and Ty. The second part of the Show features the five year old who had cancer in one eye. At age two, his Eye was removed and the youngster is playing golf and enjoying himself. Tom Harrington, who has macular degeneration, putts on the first green at Edgmont Country Club in Delaware County. Mario Tobia stood on the first tee of Edgmont Country Club, took a full swing, and rocketed the ball down the right side of the fairway about 200 yards while the other members of his foursome oohed and aahed. Tobia had to take their word for it. He could only go by the sound and feel of club face against golf ball to tell whether he hit a good shot. He couldn’t see the flight of the ball or where it ended up. Tobia, 52, of Mount Laurel, learned 25 years ago that he had retinitis pigmentosa, a degenerative eye disorder. “That’s the life expectancy of the disorder, and I’m near the end,” he said yesterday. But the passion of Tobia and other men and women without their sight for the game of golf is as strong as ever, thanks to the Middle Atlantic Blind Golf Association. Founded in 1948, the association uses golf to help members overcome the trauma of losing their sight. The association sponsors about 30 outings per year, including yesterday’s annual invitational charity event at Edgmont, which featured more than 20 contestants who are blind or legally blind (20/200 vision or worse) playing a scramble format. Tobia, who was as low as a 12-handicap earlier in his golf career, has been with the association for five years. He said he enjoyed the golf and socializing with his fellow members and that he didn’t take the game quite as seriously as he used to. George Pilz, 68, of King of Prussia, lost his sight in a 1958 automobile accident and has been a member of the association off and on since then. The key for blind and legally blind golfers is the coach, who stands behind his or her player and helps line up the shot. On the greens, the coaches help the players with the distance, the speed and the break. Yesterday, Tobia would bend and use his hand to check his club face against the ball on his tee shots and putts while his son, Matt, made sure of the alignment. When he plays, he uses two or three coaches, depending on their availability, and often gets in a quick nine with his son at Ramblewood Country Club near his home. Pilz’s coach is Hunter Schaff, who used to work with Pilz at AT&T and has been his coach for six years. Pilz and Tobia will represent the Middle Atlantic association at the U.S. Blind Golf Association’s 62nd national championship next week at Edgmont, in Delaware County. Tobia, who has shot in the high 80s, said he hadn’t played that well in the last two weeks but hoped to be ready. Pilz said that his scores ranged between 100 and 110, and that he was excited to meet some of his fellow competitors from all over the country. Fore! He’s a jolly good golfer! At age 8, Christian Brown already has been playing golf for three years. The Mayfair youngster takes weekly lessons and has his own set of golf clubs — seven in all — plus a collection of golf balls. Christian also is legally blind, but that hasn’t stopped him at all. “I love to play golf on a sunny day and have fun,” says Christian, who turns 9 next week. He’s an active participant in a unique program for young golfers. The Blind Junior Golf Program encourages blind and visually impaired young people from 5 to 21 years of age to play golf. It provides them with equipment — golf clubs, balls and a golf bag — and regular lessons with a PGA golf pro, all free of charge. Twice a year, those in the program get together to play golf on a nine-hole course at the Overbrook School for the Blind. At this golf clinic, as it’s called, they also participate in several competitions while family and friends cheer them on, and then enjoy a pizza party. The fall clinic will take place this Saturday, and Christian and his parents will be there; they never miss this event. Last fall, Christian even won a trophy, now displayed in a place of honor in the family living room. The Blind Junior Golf Program, including the clinic, is sponsored by the Middle Atlantic Blind Golf Association and is open to any youngster in the tri-state area, and even beyond, who’s blind or visually impaired and wants to play golf. The chip-and-putt golf course where the participants will play on Saturday was designed by Norman Kritz, a Cherry Hill, N.J., resident and co-founder of the Blind Junior Golf Program. Kritz is not blind but has a longstanding interest in community service, especially for youth. The other co-founder is Gil Kayson, a longtime golfer who is totally blind. He lived in Northeast Philly for 30 years, before moving to the Breyer Estates in Elkins Park with his wife Sandy. Kayson, now in his 70s, had to confront failing vision that started in his 30s. He loved golf but gave it up as his condition worsened. By age 50, Kayson was totally blind. But by then he’d discovered the Middle Atlantic Blind Golf Association and was playing golf again. He has played ever since and is still an active member of the association. In 1994, Kayson teamed with Kritz to start the Blind Junior Golf Program. They began to recruit youngsters, as well as golf pros to serve as coaches. Each time a new member joins, a PGA member is assigned to give free golf lessons. Kayson and Kritz also make sure each youngster has the proper equipment. Golf clubs are often donated by area golf clubs or individuals. “Then we cut the clubs down to fit the size of our players,” said Kayson. Of course, he’ll be at the golf clinic on Saturday, helping to supervise the contests and hand out awards. Watching the young blind golfers continues to give him great satisfaction. Christian and his parents learned about the program from a social worker when he was still in preschool. Eager to learn more, they attended a golf clinic and met Kritz and Kayson, who arranged to have golf clubs made to order for Christian, as is done for every participant. They also put him in touch with a golf coach, Daniel Hoban, the resident pro at the John F. Byrne Golf Course. He’s been taking lessons with Hoban at the Torresdale golf course every week, weather permitting. Now a third-grader at the Redeemer Lutheran School, Christian has been visually impaired since infancy. When he was 2 months old, a routine medical exam led the doctor to notice that Christian didn’t blink when she snapped her fingers. She ordered an MRI and he was soon diagnosed with DeMorsiere’s Syndrome. It might seem surprising that a youngster with this disability can play golf at all. “But you don’t have to visualize the hole,” Brown said. “It’s all in the technique of holding the club and hitting the ball. The youngster practices with enthusiasm. He’s such a diligent golfer that he even practices at home in his bedroom, using a paper cup as the hole. Beyond his love of golf, Christian keeps busy with karate. He’s in the black-belt program at Action Karate on Academy Road, where he takes regular classes. Her son has been in the Junior Blind Golf Program for three years, and Judy Brown has found that it benefits parents too. She and her husband will meet many other parents on Saturday. The golf course will be full of action as the young golfers, together with their coaches, play nine holes and compete in a putting contest and a hole-in-one competition. Besides the fun, there’s another reason that the golf clinic is special. Any young person from age 5 to 21 who is blind or visually impaired is welcome at the free golf clinic this Saturday, 10 a.m. to noon, at the Overbrook School for the Blind, 63rd Street and Malvern Avenue, rain or shine. For information, call Gil Kayson, 215-884-6589, or send e-mail to sasgil@verizon.net. LEHIGHTON, Pa. – Sheila Drummond didn’t need to see her hole-in-one. She heard it. Drummond, blinded by diabetes 26 years ago, experienced the highlight of her golfing career Sunday, recording an ace on the 144-yard, par-3 fourth hole at Mahoning Valley Country Club. Playing with her husband and coach, Keith, and two friends in a steady rain, the 53-year-old Drummond hit a driver on the hole. The shot cleared a water hazard, flew between traps and landed on the green, where it hit the flagstick before dropping into the hole. In 1999, Golf Digest said the odds of an amateur getting a hole-in-one are 1 in 12,750. That number, no doubt rises, for a blind golfer. Drummond is a member of the board of directors of the United States Blind Golfers Association, and the organization believes she is the first totally blind female to record a hole-in-one. “We’ve looked everywhere, and haven’t been able to find anyone else,” she said. Drummond took up golf about 15 years ago, and three years later qualified as the first female member of the USGBA. “I just try to do the best I can,” said Drummond, who carries a 48 handicap with the USGBA. “I get nervous.